Spicy, tangy, homemade chicken enchiladas topped with a “from scratch” cream sauce and sprinkled with cheese. An easy, delicious dinner that you can make ahead. Chicken or turkey enchiladas are delicious – and if you have only eaten them at a Tex-Mex chain restaurant you haven’t really eaten them at all. When made right the flavors are fresh and intense no matter what the filling is. And the filling? It doesn’t have to be just ground beef. Chicken, turkey, cheese, vegetables of different kinds – well the variations are endless. That’s before you even start decided on which sauce you want to use! I think one of the biggest mistakes that people make is that they try to make enchiladas with a dry tortilla. You have to dip the tortilla in the warm sauce to soften it before you roll it up. It helps infuse the whole dish with flavor that won’t happen otherwise. And can we talk tortillas for a minute? I realize that many of you will prefer the white flour tortillas but corn tortillas have so much flavor! AND texture… and they are better for you. They won’t get soggy when you dip them so they are my tortilla of choice for enchiladas. Y’all know I am right. This chicken enchiladas recipe has chicken, corn, onions, and plenty of other good things stuffed inside a corn tortilla dipped in homemade enchilada sauce. If you eat enchiladas a lot you can even make the sauce ahead in a double batch and keep it in the fridge. Knowing how to cook the chicken for the enchiladas is key. First it’s browned and then simmered to flavorful perfection. The chicken is tender, the tortilla is soft and full of flavor, while the sauce has that perfect combination of tangy and hot – with plenty of cumin to remind you that this is Texas food. The cheese is melted gooey perfection and is absolutely addictive. The cream sauce pulls everything together in a surge of southwestern flavor that you won’t easily forget. Want to make a couple of batches for later? Go right ahead. These freeze well and, if anything, reheating makes them even better. Really, how can you resist something like that? Yeah. Me either! Spicy, tangy, chicken enchiladas topped with a cream sauce and sprinkled with cheese. An easy, delicious dinner that you can make ahead. Grease a 13x 9 inch baking pan. Add a little oil to a large sauté pan and add the chicken. Brown it quickly on both side and then cut it into cubes. Add onion, cumin, garlic, corn, Ro*Tel, and cilantro to the chicken and simmer until the juice is reduced. Remove chicken and vegetables and set aside. Add a little more V-8 if necessary and bring the liquid to a simmer. Cover the bottom of the baking pan with a little of the liquid. Dip in one tortilla into the pan and let soften (but don’t let it get mushy). Lay the tortilla out on a plate, spoon about 3 tablespoons of filling inside, sprinkle with cheese, and roll up. Melt butter in a saucepan and stir in the flour. Whisk in hot chicken broth and cream - bring to a boil, stirring. Add cream cheese and blend well. Pour the sauce over the enchiladas in the pan, top with ½ cup cheese. Bake for 20 minutes, or until heated through and the cheese is melted. Serve with sliced avocado, sliced tomatoes, and buttered rice. These sound delicious! My family would devour this dinner in a hurry! Thank you so much, Jocelyn. Girl – of course you are right. I didn’t know about dipping the tortillas. Glad to be in your tribe to get the real scoop. Can’t wait to try these Marye, thanks! I love chicken enchilaadas…these look great! I’m always on the lookout for new versions to try. My family doesn’t love corn tortillas…I do though. Sometimes I make them with the corn, but usually with the flour version. My husband’s Lebanese grandmother, who emigrated to the US through Mexico first, used to make her enchiladas with Syrian bread. And they were delicious too! I LOVE making homemade enchiladas. I never make the sauce a cream sauce though, this sounds AMAZING! Regarding the corn versus flour tortillas, preach it, sista! My kids insist on eating flour and I just do not get it! These look fantastic! Thanks so much! Even the whole grain flour tortillas hold up better… you might try those. Thank you for the tip on dipping the tortillas first – definitely going to give that a shot and see if it works better for me. Its sounds like a genius idea! These enchiladas look like perfect comfort food. I eat seasonally, and I start to anticipate the upcoming ripe veggies with relish. With the Hatch chile harvest approaching I’m eyeing ways to incorporate them. My local grocery store gets cases of Hatch chiles and roasts them in the parking lot–then I pick up a tub and am good to go. Those chiles would be perfect for this! Yes Marye, you are so right. Corn tortillas all the way and dip them in sauce. I did not know about the sauce dipping. I love visiting here because I always learn something new. Great post and delicious recipe! Love chicken enchiladas. I’m not a huge cream fan but these look amazing. My daughter loves to go out for enchiladas. They may be her favorite food ever. She would love yours. Looking cheesy, creamy, and spicy-licious! I love, love, love your cream sauce, particularly since it is not made with any cream of soups. Saved! Thanks! I really love these enchiladas! I am such a big enchilada fan! Love this cream sauce! 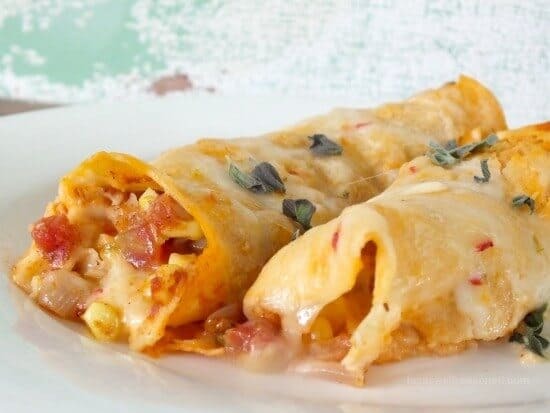 These enchiladas look great and I really like the idea of using a cream sauce for them! We have them that way all the time here. 🙂 So good! These enchiladas look fab and I’ve pinned them for later, thanks! Let me know how you like them, Emily! These sound great, and I bet the V-8 juice adds some great flavor to the dish. I love having them in the freezer! Mind. Blown! Wow, I never thought of putting cream sauce on enchiladas. Thank you! I’m pinning this to make soon – as in next week? Yum!!! 1. rotel – tomato with chilis or without? 2. v8 – when and how much to add? These look delicious Marye. Love the cream sauce!